This highly anticipated new series starter from Veronica Roth is NOT Divergent (nor should it be). Even when reading blurbs I still didn't know what to expect as there have been a lot of conflicting reviews. Add to that the allegations of racism for poor Miss Roth, and we've got quite a bit of dissension. However, I hope I can shed some light on this book for everyone, since I took a different approach than my fellow reviewer Stéphanie who talks more about the main characters, though I might be proven wrong in subsequent books. This is my interpretation and I encourage everyone to have their own! First, most readers are going to be expecting another Divergent in this series which it's not. Divergent was fast-paced, relied heavily on action, and used more of the character's reactions to certain events as a plot device. Instead, Carve the Mark is very introspective, and I would argue, very adult in its slower pace and buildup. 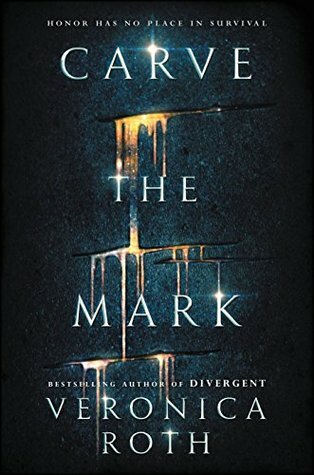 The main characters sort of force much of the action in Carve the Mark because of the inner battles they are facing-an inward to outward shift of character that is complete opposite to Tris who made a lot of decisions outwardly and then came to understand them inwardly much later in the series. It's going to be hard to get a reluctant reader into this series (very unlike Divergent!) and might even be better off for older teen/young adult (college) or adult readers since it deals with this coming-of-age theme in a much more mature, thought-provoking way. Picture the modern Icelandic people--they are Norse ("nordic" is derived from the word "northern") and have predominantly light colored eyes and blond or brown hair and fair skin (white or red tones). "Icelandic culture has been shaped by isolation and the extreme forces of nature. These conditions have created a resilient people, where family ties are close, the sense of tradition is strong, and the bond with nature is tight. While strongly rooted in customs and traditions, today's Icelandic society is both modern and progressive. A small country by most measures, Iceland has a high standard of living, extensive political freedom, and has taken an active role in sustainable development and commitment to the environment." In history, the Nords were conquerors (think of the Vikings), but today Iceland is known for being one of the most peaceful countries in the world and one of the most progressive among human rights. People from the Mediterranean (think Spain, parts of Italy, Greece and upper Africa) and the idea of the Gypsy or Romani people in history or Native Americans. They have a bit darker skin and hair with more variations in hair, skin, and eye color. Some Native American culture and Romani culture place emphasis on being nomadic and moving from place to place. Both have a high regard for religion and made use of things others would discard. Both have a strong history of oppression and have been described in some instances as violent (or perhaps take violence in more acceptable form - passion). Let's also note that it is well known that geography and relation to the sun has resulted in the variety of color and skin tones we see in the world today. How should that be no different for the ice-loving Thuvhe and the once-nomadic Shotet? However, according to Roth's specific writings which she covers in this blog post, the Shotet and the Thuvhesit are much closer than they may appear to be at first glance, which some readers have painted as racist and black vs. white, brutal vs. enlightened, etc. Because of each side's extreme attitude toward the other, they don't have any reference for how they might have commonalities among their cultures. There is light and dark in both Thuvhe and Shotet which Akos himself represents as having a "Shotet name" belonging to a Shotet religious leader and can naturally speak Shotet yet he is fair skinned (and no mention of his parents being anything other than typically Thuvhe). This is the version I've read as Cyra herself describes her brother Ryzek having "skin so pale he looked almost like a corpse [in bluish light]". As for the Thuvhesit considering the Shotet violent, this is automatically understandable as Ryzek, like his father and grandmother before him, is a power-crazed dictator not unlike Hitler, so their reputation is gained from their leader and his orders, much the way Germany's was in WWII. However, the history of the Shotet that Cyra relates to us is not violent but reverent of the currentstream and following it on a religious pilgrimage every year and using other cultures' castoffs to find use or beauty. This book does not make the idea as generalized as black vs. white, Nordic/European vs. African/Native American etc., barbarian vs. enlightened, but more about two halves of a bloodline that is messy yet prejudiced against the other [I can oversimplify here and say the bloodline of Ishmael or Arabic/Palestinian vs. Isaac or Hebrew/Israeli--not intending to offend people with this oversimplification, but just trying to draw some generic parallels that have occurred in history]. The Shotet and Thuvhesit are very mixed and quite hard to generalize if one pays close attention to the descriptions, the history, and the fact that both cultures misunderstand the other. As for the ableist remarks, Cyra's currentgift manifesting as chronic pain and use as a weapon and how anyone possessing a disability or having chronic pain and calling it a gift is actually not a gift, one should also be reminded that Roth herself suffers from chronic pain [she revealed this after the book was published and allegations were raised, and we also know that Roth has had certain anxieties from social interactions and her fame, so it's no wonder this didn't come out before! She likes to be super private! ], knows others in chronic pain, and her character Cyra does not think of this as a gift no matter that others seek to use it to their own ends. Instead, Cyra is part of the very rare few (currently we do not know of any others but there may be) whose currentgift, which is the current's manifestation of personality, harms herself and harms others. She did nothing to deserve it, does not seek to use it for her own selfish reasons, and doesn't understand it. Neither do any doctors/scholars they seek understand it or how to help her be rid or helped with it. It's true that the terminology makes the ableist accusations problematic, but currentgift is used synonymously with ability. Everyone has abilities and disabilities. Everyone has a currentgift. Most everyone's currentgift (that we know of) is an ability. However, Cyra's is most definitely a disability as it limits her mental and physical functionality. Yet once again, she doesn't think of it as a gift or skill or something to be favored or used, so I would argue that she is a main character with a disability who everyone judges, shuns, uses, or limits/labels her based upon her disability. Thereby, she is a main character exposing the ableism present in her society, but not advocating for ableism. Instead, this illustrates Cyra's powerfulness as a heroine--she suffers from chronic pain and is abused by her brother for her pain, and yet she constantly seeks to function past it--to live, survive, make her own choices--even when she is forced to use it against others. Nevertheless, like any book with a lot of controversy, the reader should be free to judge for oneself. 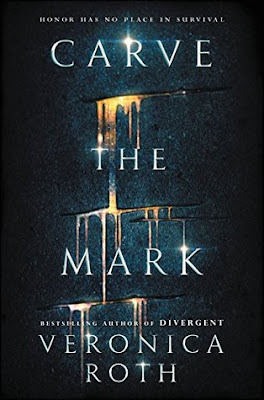 Lastly, Carve the Mark seems more like a (pardon me for oversimplifying again) version of Romeo and Juliet without the level of tragedy and star-crossed romance as two sides who hate each other have two teens who are bridging that gap to change their world. I found it to be really inspiring, thought-provoking, harder to jump into than most YA, but still a great story. Read-a-likes for this title could be other space fiction like Star Wars, Illuminae, the Red Rising series and Starflight.